Organizations don’t know what’s going on inside their networks, and that’s costing them real money. 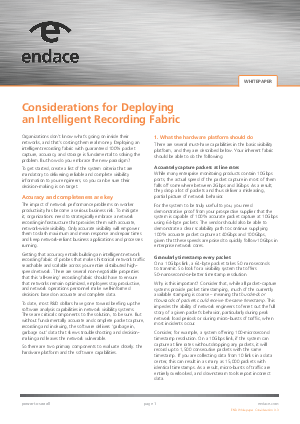 Deploying an intelligent recording fabric with guaranteed 100% packet capture, accuracy, and storage is fundamental to solving the problem. But how do you embrace the new paradigm? To get started, create a list of the system criteria that are mandatory to delivering reliable and complete visibility information to your engineers, so you can be sure their decision-making is on target. The impact of network performance problems on worker productivity has become a serious business risk. To mitigate it, organizations need to strategically embrace a network recording infrastructure that provides them with accurate, network-wide visibility. Only accurate visibility will empower them to slash maximum and mean response and repair times and keep network-reliant business applications and processes running.